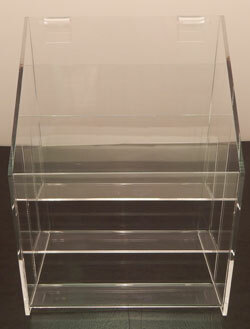 This is a triple tier acrylic brochure holder. The tiered design allows you to separate your displayed brochures. It also allows for an easy browsing experience. The clear acrylic design is great for any retail environment due to its ability to easily blend in with your current design aesthetic. Flame polished edges give this display a smooth and clean finish. We carry versions to fit any sized brochures you have. 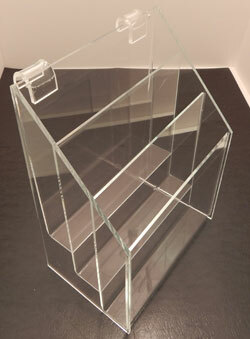 This acrylic brochure holder has 3 tiers, making it easy to see each level. It comes in two sizes. You can choose from the options below. Clear acrylic construction is highly durable and gives a clean professional look.